Roomba upside down. Here you can see the large height-adjusting wheels that allow it to handle carpeting as well as hard floors. Two brushes, a beater brush and a bristle brush. The side brush can be seen at the upper left. The bin is at lower left, with one of the yellow HEPA filters visible inside the bin. 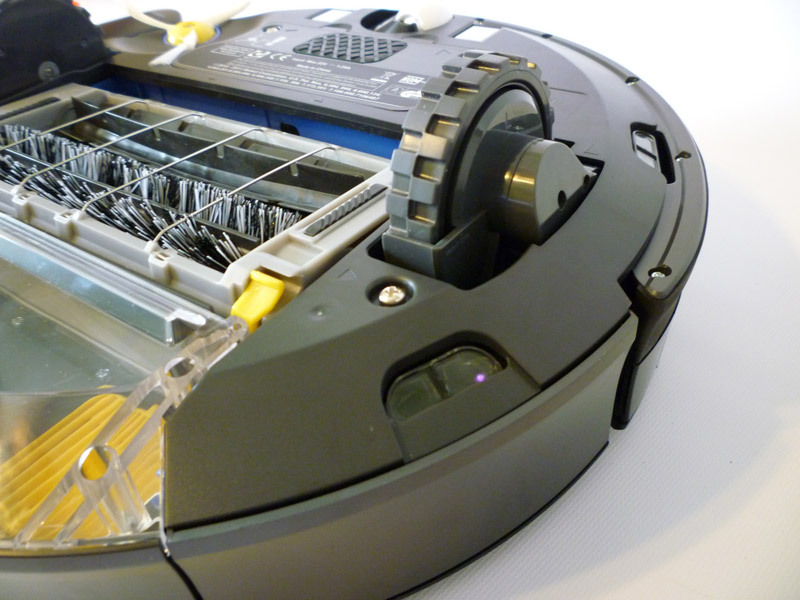 I got my Roomba 770 back in December, so I've been using it regularly for several months now. What can I say..... I love my Roomba! It's amusing, really.... I never thought I'd say I "love" a cleaning appliance. But I do — I love my Roomba. If you go to Amazon and read the user reviews on Roombas, there are probably more people saying that they "love" their Roomba than I've ever seen for any other product. Every day I push the "Clean" button, and my Roomba (I call it my floorbot) runs around and vacuums my house, then takes itself back to its home base to recharge. It could be even easier: I could program in a daily cleaning schedule so that I don't even have to push the Clean button, but I like to run my floorbot when the dogs are outside, because they're not fond of it. It doesn't freak them out, but they're just not fond of it. Okay, so it's not quite that easy. Each day after the floorbot finishes cleaning I have to empty the bin. And every few days I need to clean the brushes. And every few months I have to replace the HEPA filters. But it really is easy. I have 2 large-ish dogs. They go outside and swim in the pond, and then go roll around in the dirt, and then come into the house and leave sand dunes all over. Not to mention the dog hair! I was constantly sweeping and Swiffering and vacuuming. If I didn't do it every single day, it would get totally out of hand. Now my floorbot takes care of that for me. The bin is large enough that my Roomba can clean the LR, DR & kitchen in one go. If I miss a day, or if there's been a major dirt event in the house, the bin will get full, and the Roomba 770 has a "full bin" indicator light to let me know that I need to empty it. The other parts of the house that I do one wing at a time usually don't fill the bin. The HEPA filters trap the tiny dust particles and allergens. I tap them against the side of the waste can to remove the loose particles every time I empty the bin, and once in a while I take them outside and shoot them with a blast of compressed air. It's amazing how much comes flying off them when I do that; it gives me a clue how much they're actually picking up and filtering out. It goes from tile to wood flooring to area rug to wall-to-wall carpet without any problems. It has a debris-detection sensor. When it detects that an area of the floor is particularly dirty, it goes back and forth over that area for longer than it normally would. This happens a lot in the areas where my dogs like to nap. The Roomba can't move the couch away from the wall to vacuum behind it, of course, or move other stuff out of the way. So I often go around and move some the furniture a few inches this way or that way so that the Roomba can get areas that it wouldn't normally get. It's very good at running along the baseboards and circling table legs and going under tables and such. It also cleans under the beds — I mean, all the way under the beds — and gets into other places that I might not get when I vacuum with my big vacuum cleaner. Why live with dust bunnies under your bed? You don't have to when you have a Roomba! Cleaning the brushes is easy. They pop right out for cleaning, and it came with a cleaning attachment to use. I raided my little-used sewing kit for a seam ripper to use on the ends of the brushes when hair or dog fur gets wrapped tightly around the ends. Periodically I pull out the small front wheel and remove hair/fur from it. It just pops right out. The cons? Yes, there are some. First, as I said, Roomba can't move furniture around. Sometimes I just really need to move everything out of the way and do a more thorough job with my big vacuum. It's not a total replacement for old-fashioned sweeping and vacuuming. But I have to vacuum far less often than I did before. Second, it doesn't get into corners very well. Edges — like along walls — yes, but the little side brush isn't quite long enough to reach all the way into a 90° corner. I'll periodically go around with a broom and pull out the corner debris so that Roomba can get it. Third, I do need to prepare the room. I pick up sneakers and sandals lying around, and put the dogs' tennis balls away, and pick up other stuff that would either interfere with cleaning or that the floorbot might get hung up on. A side benefit of this is that my floors stay uncluttered better than they did in my pre-floorbot days. Fourth, sometimes it gets itself stuck somewhere. Back in the guest bedrooms is most common. It'll run along the wall next to the door, push the door closed, and then it can't get out of the room. Fifth, sometimes it has trouble finding its way home. I'll occasionally find it with its "Docking" light on looking for home, but it's over in a far corner of the room away from where home base is. In the other wings of the house, it can't go home on its own because the virtual walls stop it. So it just vacuums until it has no more juice, then it stops dead. No big deal; I just pick it up and carry it back to home base. 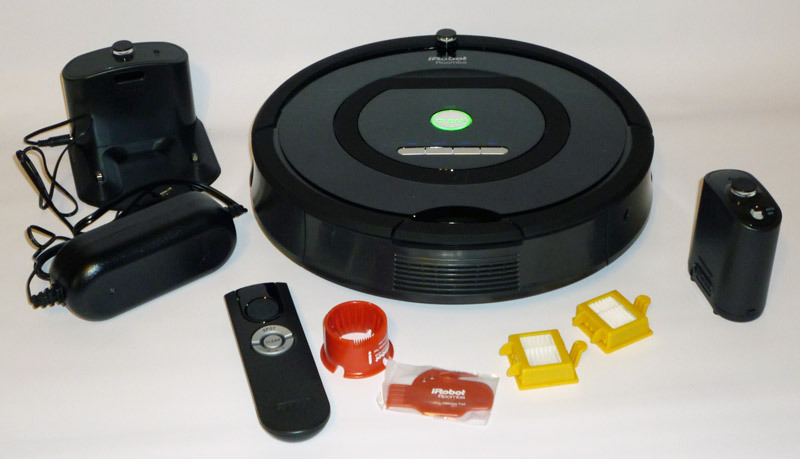 The 780 can use virtual lighthouses (something different from virtual walls) to direct Roomba from one room to another. iRobot calls it "room-to-room navigation." The 770 and 760 don't have that capability. At about 2,400 square feet, my house is too big to do the whole house in one go, and only the main area of the house really needs vacuuming every day anyway. So this didn't matter to me at all. I wouldn't use the room-to-room navigation even if I could. The 770 and 780 have the "Dirt Detect Series 2" debris sensing technology, while the 760 has the older "Dirt Detect" sensor. I can't speak to the differences, if any, but the iRobot people do seem proud of their Series 2 dirt detection. The 760 and 770 have buttons, and the 780 has touchpad control. I don't care the slightest bit about this. Push a button, push a touchpad. Not something I'm going to pay extra for. The 770 and 780 have the full-bin indicator light, and the 760 does not. I like having the full-bin light. The vast majority of the time, my Roomba finishes cleaning and goes home to recharge without triggering the full-bin light, but if I happen to notice the full-bin light while Roomba is still cleaning, I know to empty it. All 3 models have scheduling for automatic cleaning at set times, all 3 use the HEPA filters, and all 3 have the AeroVac Series 2 type of bin. I don't know what AeroVac Series 2 means, but it sounds good. All 3 models come with a remote control, which you can use to manually steer it around, turn it on, turn it off, tell it to spot clean, or tell it to go to home. The 760 sells for $450, the 770 for $500, and the 780 for $600. I thought the extra $50 to get the 770 rather than the 760 was well worth it to have the full-bin light and the Dirt Detect Series 2. I didn't think the extra $100 to get the lighthouse technology on the 780 was worth it at all. I don't know how I ever managed without Roomba. Next on my list is one of those iRobot Scooba floor-washing robots.